HP 130A CF353A ΑΝΑΚΑΤΑΣΚΕΥΑΣΜΕΝΟ ΣΥΜΒΑΤΟ TONER ΓΙΑ ΕΚΤΥΠΩΤΕΣ ( HP LaserJet MFP176,177) 1.000 ΣΕΛΙΔΕΣ ΚOKKIΝΟ. HP 130A CF351A ΑΝΑΚΑΤΑΣΚΕΥΑΣΜΕΝΟ ΣΥΜΒΑΤΟ TONER ΓΙΑ ΕΚΤΥΠΩΤΕΣ ( HP LaserJet MFP176,177) 1.000 ΣΕΛΙΔΕΣ ΚΥΑΝΟ. HP 130A CF352A ΑΝΑΚΑΤΑΣΚΕΥΑΣΜΕΝΟ ΣΥΜΒΑΤΟ TONER ΓΙΑ ΕΚΤΥΠΩΤΕΣ ( HP LaserJet MFP176,177) 1.000 ΣΕΛΙΔΕΣ ΚΙΤΡΙΝΟ. HP 130A CF350A BLACK ΑΝΑΚΑΤΑΣΚΕΥΑΣΜΕΝΟ ΣΥΜΒΑΤΟ TONER ΓΙΑ ΕΚΤΥΠΩΤΕΣ ( HP LaserJet MFP176,177) 1.300 ΣΕΛΙΔΕΣ ΜΑΥΡΟ. SAMSUNG MLT-D117S BLACK ΑΝΑΚΑΤΑΣΚΕΥΑΣΜΕΝΟ TONER ΓΙΑ ΕΚΤΥΠΩΤΕΣ 2.500 ΣΕΛΙΔΕΣ ΜΑΥΡΟ. SAMSUNG 4072 CLT-K4072S BLACK ΑΝΑΚΑΤΑΣΚΕΥΑΣΜΕΝΟ ΣΥΜΒΑΤΟ TONER ΓΙΑ ΕΚΤΥΠΩΤΕΣ 1.500 ΣΕΛΙΔΕΣ ΜΑΥΡΟ. 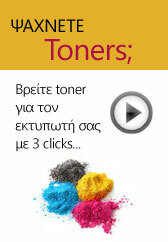 HP 36 A CB436A ΑΝΑΚΑΤΕΥΑΣΜΕΝΟ ΣΥΜΒΑΤΟ TONER ΓΙΑ ΕΚΤΥΠΩΤΕΣ 2.000 ΣΕΛΙΔΕΣ ΜΑΥΡΟ. SAMSUNG MLT-D205S BLACK ΑΝΑΚΑΤΑΣΚΕΥΑΣΜΕΝΟ TONER ΓΙΑ ΕΚΤΥΠΩΤΕΣ 2.000 ΣΕΛΙΔΕΣ ΜΑΥΡΟ. HP 125A CB542A ΑΝΑΚΑΤΑΣΚΕΥΑΣΜΕΝΟ ΣΥΜΒΑΤΟ TONER ΓΙΑ ΕΚΤΥΠΩΤΕΣ HP Color LaserJet CP1210, CP1215, CP1515, CP1518, CM1312mfp 1.400 ΣΕΛΙΔΕΣ ΚΙΤΡΙΝΟ.